Companies seeking to effect organizational through the medium or process of downsizing may find that the means to such an end may be flawed, causing more harm than doing any good. Downsizing is the process of reducing staff numbers and/or divisions of a company and has been a widespread change practice since the 1970s. Fortune 500 companies have been recorded to have cut back on their collective workforce by 1,040,466 in 2001 alone. Reasons for engaging in this change process range from restructuring, cost cutting or savings, selling of a business unit, increasing productivity or responding to external pressures such as recessions or economic down turns. 1. Political gaming and lobbying increases during downsizing in order to retain positions, sometimes at the overall expense of the organization. 2. Employees unscathed by the exercise may doubt their future in the company which could impact on productivity negatively. 3. Core competences could be lost or underutilized because they were linked to people who were lost in the downsizing. 4. Reduction in morale and guilt feelings as retained employees attempt to validate/justify their own retention, wondering if they may become victims of future downsizing. 5. Non-selective and unplanned downsizing could call into question the necessity and effectiveness of the overall exercise which could strain employer-employee relations. 6. Disruption of informal networks and subcultures that exist in all organizations previously drawn upon to implement organizational work. 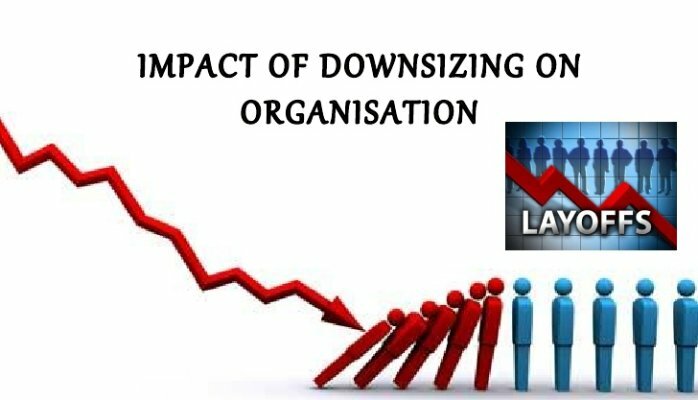 Downsizing in of itself will not necessarily lead to gains in productivity where it is not associated with other changes in business strategy and as such organizations embarking on such a change exercise must ensure that the benefits outweigh the costs which should be beyond only pure financial motives as managing retained employees presents its own challenge and could undo the original intent of the act.